The English Channel Urchins, as well as other sea urchins belong to the class Enchinoidea. Scientific name. Eichinus esculents. This is the same group of water based animals that include the sand dollars. These creatures do not have arms. They have movable spines that can swing in any direction. These creatures have tube feet arranged in 5 pairs extending around the body. The feet are tipped with suckers that reach behond the spines. Around the urchin's mouth are tube feet that can attach to its food. The tube feet draws the urchin's mouth to its food and feeds by gnawing with teeth called "Aristole's Lantern". 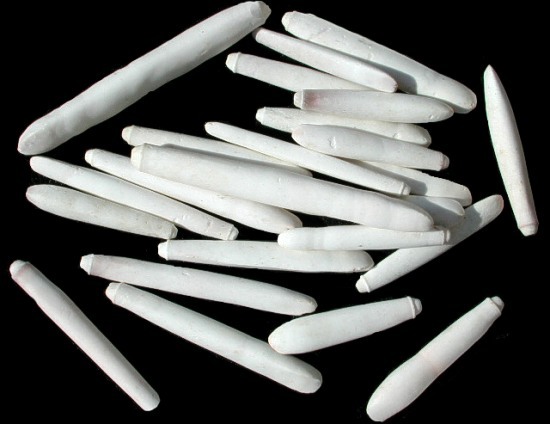 This structure consists of 5 teeth. 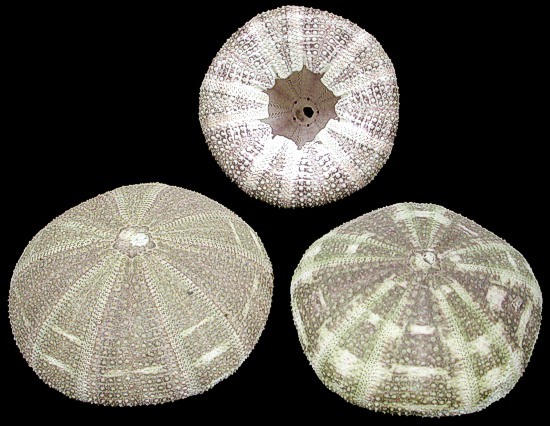 Aristotle's Latern is not developed well in urchins. They primarily feed on plankton and organic particles trapped on mucus. 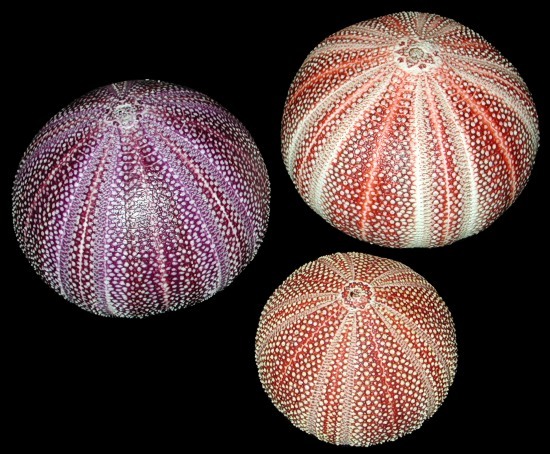 English Channel Urchins are found in the eastern Atlantic and along the eastern Pacific coast ranging from Alaska south to the tip of Baha California. 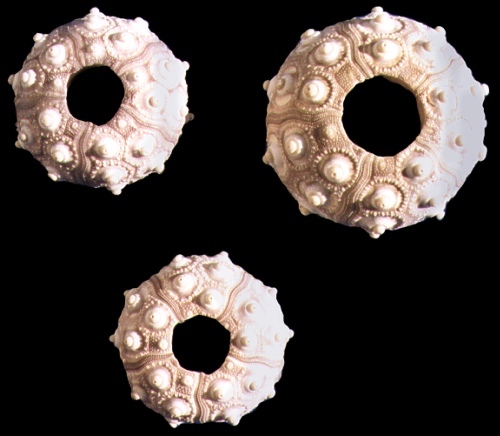 English Channel Urchins are sought by Orientals for the eggs. 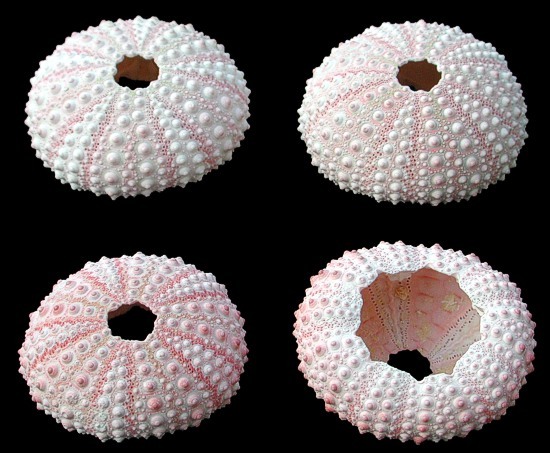 The urchin eggs are collected thru the bottom of the urchin. 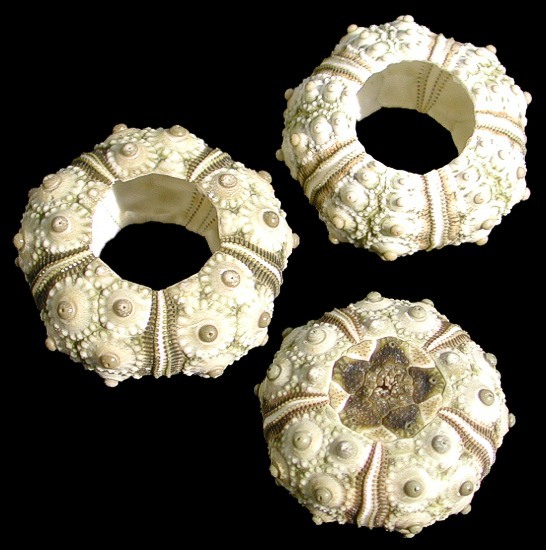 You will notice the bottom opening of the English Channel Urchin. This opening is often used to convert the carcass into a lamp (which we offer). Tne Alfonso Urchin is popular for its markings. It has a chalky design decorating a green background. It appears that the chalkiness is more pronounced in the more mature urchins, giving the look of being covered by powder. 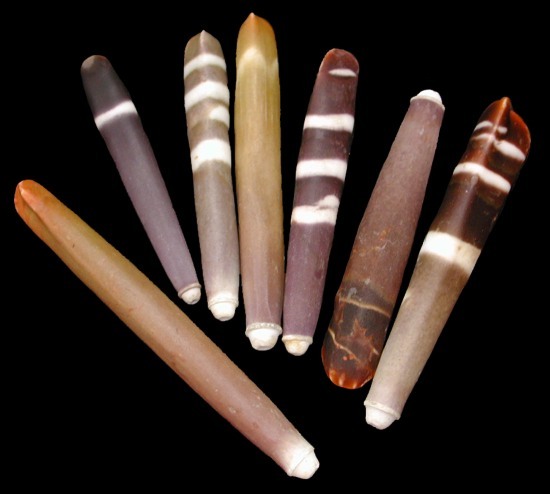 The specimen we are offering are from the Indo-Pacific rim. This ranges from the Western Indian Ocean to the Sea of Japan and Northern Australian shores to the East. The shades of green vary. 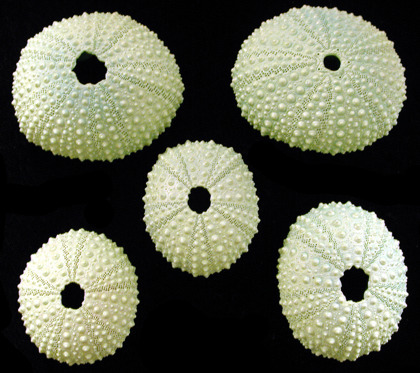 Some urchins are dark green, others lite green while others have a hint of pink mixed into the green. Pink Dyed Urchins are great for crafts. The dyed color ranges between a very light purple to light pink. Imperial Sea Urchin Scientific Name: Phyllacanthus imperialis Species: Sea Urchins (Cidaridae) Other names: Imperial Urchin, Pencil Urchin, Pencil Sea Urchin, Lance Urchin, Sputnik Urchin, Sputnik Sea Urchin, Sputnik Sea Urchin Seashell, Knobby Sputnik Sea Urchin, Mine Urchin, Land Mine Sea Urchin. 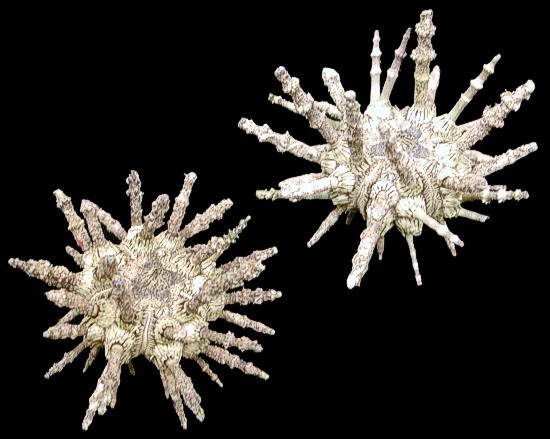 The Whole urchin includes its spines; some spines can be loose and easily detach. Most do not have their center star. Please do not request urchins with stars only.